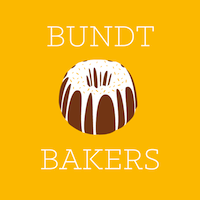 Welcome to the November reveal day for Bundt Bakers! This month Lauren from Sew You Think You Can Cook invited us to bake up a "Bundt with pears" - and any pear would do! Dried, liqueur, fresh, puree - the options were pretty much endless. This recipe was really, really fantastic. It is probably one of the few times I can say this - but these didn't even last 24 hours in my house! I made it in the morning, and we all had a piece in the morning - because it's really just FRUIT!! And then I sent a wedge to a friend's house that evening, then my boyfriend came over that evening, had a piece, and took the last of it home. I will call that a cake success any day. Lightly grease a large bundt cake pan. In a large bowl combine: flour, baking soda, baking powder nutmeg, and allspice. In a separate medium bowl blend together the eggs, pumpkin puree, sugar, buttermilk, and oil. Pour wet mixture over flour mixture stirring until just combined. Gently fold in the diced pears. Pour cake mixture into bundt pan and bake for about 35-40 minutes or until a skewer inserted in the middle of the cake comes out clear. Allow to cool in pan for about 20 - 30 minutes. When cool enough to handle, gently invert onto a cooling rack and allow to finish cooling. "Mom, you take my picture please?" Great pan and I love those big chunks of pear in that cake. Me too! It was the best part! Pretty to look at but tastier in my tummy. Your cake looks delicious. What a beautiful heart shaped bundt and I love that you used pumpkin with the pear, great combination. Wow this sounds like heaven! Well done, and gorgeous too! I love that pan too!And pear with pumpkin sounds very good! So beautiful in the heart shape! And must be really delicious the combo of pumpkin and pears! I'm glad your cake was a hit! I hope you have a wonderful Thanksgiving. Aww, such a cute little helper you have there. Your cake looks amazing too. Everyone has come up with such creative ideas this month. Pear and pumpkin...yes, yes, yes! Sounds lovely! I think I can understand why it disappeared so fast!